This mom with an ovarian condition has been sharing her story on social media in the hopes of encouraging other women not to shave their bodies. Stay-at-home mom and housewife Milena Jonas, who lives in Berlin, Germany, was diagnosed with polycystic ovarian syndrome (PCOS) – a hormonal disorder common among women of reproductive age – after giving birth to her daughter in 2014. Milena had for years before she as finally diagnosed suffered from irregular periods, skin problems, hair loss on her head, weight gain, tummy pains, depression, hot flushes and excess hair growth known as hirsutism. It wasn’t until she developed insulin-resistance after her daughter’s birth that doctors finally diagnosed her with PCOS. For 15 years, the 31-year-old, who’s Swiss-born, spent hours every day shaving hair from her legs, armpits and stomach. It wasn’t until Milena’s husband of seven years, Denny, asked her why she spent so much time removing her body hair that she started to realise she didn’t need to shave to be beautiful or fit in with society. “I think I've tried almost all methods of hair removal. For me, shaving with disposable razors was the best method,” Milena said. “It took me hours until I was completely shaved. I shaved my legs, stomach, shoulders and my face. With Denny telling her she could still be a feminine woman with hair and that she shouldn’t conform to society’s pressures to fit in, Milena stopped shaving in July 2017. “My husband knew from the beginning of my hairy problem. I’m fortunate to have a very understanding, empathetic and supportive husband. “He saw how much I suffered and encouraged me to no longer be ashamed of my body and not to bow to social pressure. “He has often told me how beautiful I am and how proud he is that I am his wife. That helped me a lot. We talked a lot with each other, and he showed me that even with my hair, I’m a fully fledged feminine woman. 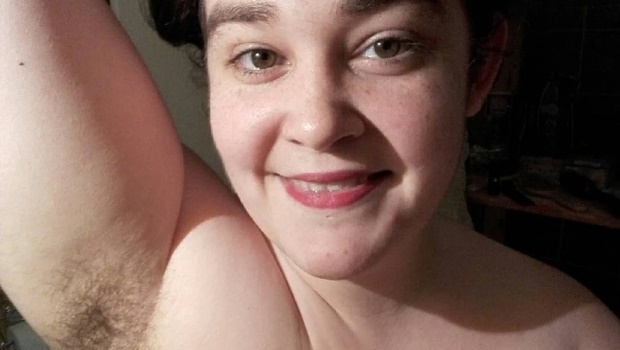 At first, she thought people would think she was unhygienic, dirty and disgusting for not removing her hair but now she shares pictures of her body hair, which she loves, on Instagram and hopes to inspire girls and women to ditch the razors because they are beautiful as they are. “I saw photos from a woman who also suffered from hirsutism and saw that she was open about it,” Milena said. “So I decided to publish my pictures to help other people. At the same time, I began to go out hairy and no longer hide my hair. “It was a process in which I became more and more self-confident. I’ve only received very positive reactions. Many admire my courage.